I thought I would show you a few days of pics from the St Patrick's Day Parade. 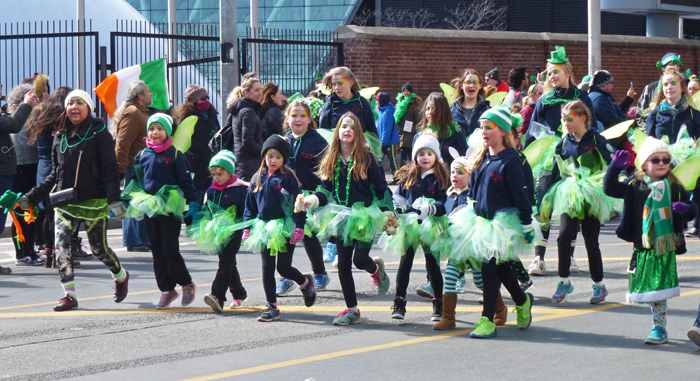 This group of kids was from an Irish dance school and they were dancing along the street in their green finery - some of them even had little green wings. I was positioned on Bloor St near the beginning of the parade so they may not be so light on their feet by the end which is a few miles away at City Hall. What a joyful dance line!! It doth appear the kiddos are having a blast. Everyone loves a parade (or so I've been told), but it's even more fun to be in one! Good job, Pat! Looks like they are having fun, and I know it was fun to watch them! At this stage of the parade, they look like they are having a fabulous time. Kids have tons of energy, they probably enjoyed the whole event. Nice shot, Pat, they are so cute ! I bet they're already talking about next year's parade! Where did all your snow go? Another fine event I missed out on. Lovely to see these tiny dancers. Your girls don;t have the bizarre wigs that all the Irish dance schools here use. These kids look much more relaxed. O dia parece bonito, com sol. Gostei da alegria das crianças em contraste com as cores. What a line of cuties! The Naples parade had four or five Irish dance schools marching, but the girls weren't dancing very much when they passed me. Too bad. I like Irish dancing.